No, it is not the popular tv show, CSI. 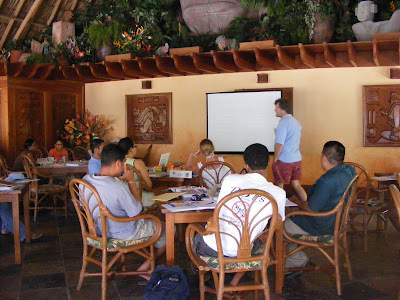 But, just like on tv, members of the Department of Environment, and/or environmental organizations rendezvoused to Ramon's Village where they began their 5-day training on Coral Reef CSI. When a coral reef gets damaged, whether from agricultural runoff, pollution, sediment deposits, ship groundings, garbage dumping, fish poachers or oil spills, marine biologists know what to look for, but not how to document and preserve their findings so they will hold up in court. 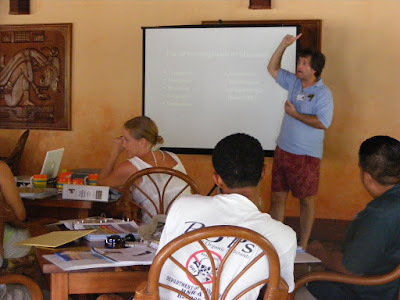 This will soon change in Belize as experts have gathered at Ramon’s Village for a five day program geared at training them in CSI-type standards which will govern such things as how to take notes under the sea, how to mark off the crime scene, how to photograph it, and how to preserve the “chain of custody” so that defense attorneys cannot argue that evidence was tampered with. The program ends with a mock court session on Sunday.